The children and staff all know that every legitimate visitor must wear an official badge to ensure the security of the site. 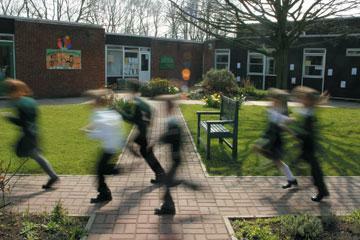 Our school buildings are modern, well designed and set in pleasant grounds. We have a foundation block that houses the large, well-resourced nursery and the three reception classes. They each have an outside area where organised play is planned and staffed. Classrooms are well equipped with resources to enhance learning. All areas have computers and a link to the Internet. 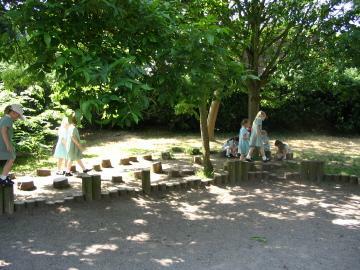 The outside area has a maze which is used at playtime and for lessons, an area closed in by logs that the children can climb and sit on, an apple orchard and a garden that the children plant and harvest each year. The back wall is decorated with paintings that the children planned and painted with the help of a local secondary school. There are two climbing frames, a willow house, plenty of seating, as well as games painted on the ground. Important security measures are in place including an intruder alarm system and CCTV cameras covering vulnerable external areas.